Fiction – hardcover; Canongate Books; 144 pages; 2004. Translated from the Italian by Ann Goldstein. When Alessandro Baricco’s Without Blood popped through my letter box earlier this week (a spontaneous purchase from Amazon.co.uk — I know, you shouldn’t let me loose on the internet), I was amazed at how anorexic it looked: 144 short pages filled with relatively large type. I read the book cover to cover in less than an hour and now, forced to try and shape my thoughts about it into some semblance of a review, I feel myself itching to read it again. The story is essentially a revenge tale, although it is tempered by other human emotions, like love and loss, memory and forgiveness, and how we are all shaped by the events of our past. It opens with a young four-year-old girl, Nina, being forced to hide in a hole under the floorboards of a country farmhouse in Italy. Here she is safe from the murderous men who brutally kill her father and her brother. During the killing spree one of the attackers finds Nina’s hiding spot but leaves her alone, a moment which we later find out has haunted him his whole life. 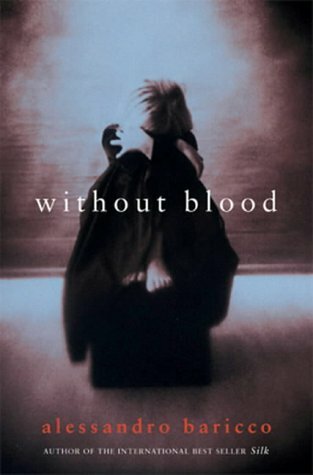 Without Blood is a quiet, understated read. The prose is restrained, economic, minimal. Even the dialogue between characters is clipped and sparse. There is no extraneous detail of any kind, so there is nothing to get in the way of the story. Stripped down to the bare minimum, Baricco is able to demonstrate very clearly how the legacy of that one brutal day of violence has shaped the lives of the two main characters. Ultimately, this novella may be an incredibly short read, but it is a deeply affecting one that packs a powerful punch. As someone who very rarely re-reads books, I’ll be delving back into this one again soon to experience its subtle beauty all over again. Thanks Dipali, I’ll make a note to track a copy down. I’ll have to read that…..